Living... in an apartment in Monstropolis with his co-worker and best friend, James "Sulley" Sullivan. The two have been friends since college and spend almost all of their time together. 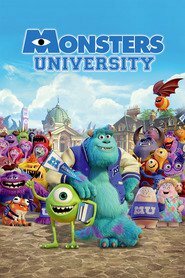 Profession... Scaring Assistant at Monsters, Inc. Mike is the technical guru for Sulley, who fills the more glamorous role of 'Scarer.' Sulley and the other Scarers must frighten human children to collect their screams, which they then use as a power supply for the city. Mike is somewhat in the background of the operation, but his job is nonetheless extremely important. He really does enjoy his work; as he puts it, "I don't know, but it's been said, I love scaring kids in bed!" Interests... helping Sulley be the most successful Scarer. Since they began working at Monsters, Inc., Mike and Sulley have been an inseparable team. And although Mike would ideally be more than just an assistant at the company, he recognizes his important role in Sulley's career and is willing to sacrifice his own potential glory for that of his friend. Relationship Status... dating Celia. In contrast to his usually goofy personality, Mike tries to be very romantic with Celia and regularly uses pet names for her like "schmoopsie-poo." They have been together for a while and he is extremely committed to the relationship, even telling Sulley that he thinks she is 'the one'. Challenge... being independent. Mike spends a lot of time in the shadow of his best friend who is popular and successful at work. Mike is not too concerned with being the center of attention himself and often reaps the benefits of having Sulley on his side. But he does have dreams of his own and would benefit from making personal gains as opposed to just experiencing them vicariously through Sulley. Personality... goofy, caring, loyal. Mike is a very giving person, and is always willing to help his friends if they need him. He is proud and confident, and he is as devoted to his work as he is to Sulley. Mike is outgoing and funny, despite his serious outlook on training Sulley to be the best Scarer. Mike Wazowski's popularity ranking on CharacTour is #43 out of 5,000+ characters. See our top-ranked characters and read their profiles.